The Flexzilla® Whip Air Hose is a short length of hose with a swivel coupler on one end to increase longevity of the main hose and reduces user fatigue by eliminating the weight of the coupler/plug. 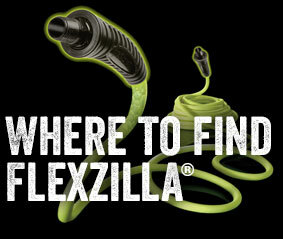 Plus, select Flexzilla Whip Air Hoses feature a 1/4 in. MNPT ball swivel. With a 30º tilt and 360º swivel action, the ball increases mobility in tight work spaces. Overall you get improved air tool ergonomics. 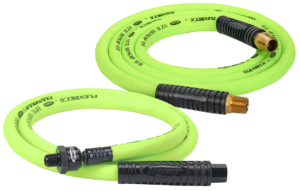 The Flexzilla® Pro Custom Length Whip Hose with High Flow Ball Swivel is a short length of hose with a swivel coupler on one end to increase longevity of the main hose. With a 30º tilt and 360º swivel action, the High Flow Ball Swivel increases mobility in tight work spaces. 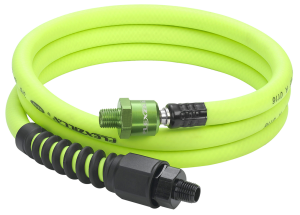 When used with High Flow couplers and plugs, the Flexzilla Pro Custom Length Whip Hose with High Flow Ball Swivel provides maximum torque, maximum RPM and the best performance for your air tools. Flexzilla Pro High Flow provides Twice The Flow – when compared to standard interchanges!